Reports have claimed that those inside Man Utd believe that Jose Mourinho is one more defeat away from facing the axe at Old Trafford. The Portuguese tactician is under immense pressure after back-to-back defeats to Brighton and Tottenham, as it comes after a summer of reported discontent. 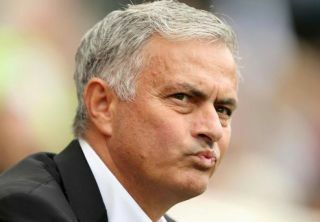 As noted by The Guardian earlier this summer, Mourinho is said to have grown frustrated over the lack of signings at the club, while as seen in the video below from his post-match press conference after the Tottenham game, he isn’t in a great mood currently. What is clear is that a win over Burnley on Sunday is needed to boost morale and silence the critics, but according to The Daily Mail, those inside the club, namely the staff and players, are said to be under the impression that should United lose this weekend, it could be curtains for Mourinho. Things don’t appear to be moving in the right direction at Old Trafford as after ending last season trophy-less and 19 points off the pace set by Premier League champions Man City, work was needed to be done this summer. That didn’t materialise and with rivals City and Liverpool both making strong starts to the new campaign and importantly also playing an entertaining style of football, it has arguably only served to add to the pressure and tension at Man Utd. Further, given his brand of football doesn’t necessarily fit the culture and approach developed at United over the years, particularly under Sir Alex Ferguson, there is always arguably an element of doubt when it comes to the current boss despite his exceptional winning record. With that in mind, it remains to be seen if results now save Mourinho starting at Burnley, with the Mail reporting that those inside the club wouldn’t be surprised if he is sacked in the coming weeks as it’s supposedly being “openly discussed” amongst them.